Soviet cosmonaut Valentina Tereshkova, the first woman to fly in space, climbs into her capsule, Vostok 6, in 1963. Cosmonaut Valentina Tereshkova, who 50 years ago this Sunday (June 16) launched aboard the Soviet Union's Vostok 6 mission, set a world record by becoming the first woman in space. But her gender wasn't the only contribution that Tereshkova made to the cultural history of space exploration — she was also the first person to wear a mission emblem on her spacesuit, although it was hidden from view. Now, half a century later, a Dutch artist is set to bring that patch into the light— and to the public — by producing replicas. Valentina Tereshkova was 25, a textile factory assembly worker and an amateur parachutist when she was chosen with four other women to join the Soviet cosmonaut corps in 1962. Her first and only mission a year later marked the twelfth manned— or rather, crewed — space flight in the world. Flying under the call sign "Seagull" (in Russian "Чайка" or "Chayka"), Tereshkova circled the planet 48 times before returning to Earth under manual control. Like the Vostok pilots that preceded her flight into space, Tereshkova had to eject from the spherical capsule and landed separately by parachute on June 19, 1963. It would take another 20 years (and two days) before the United States launched its own first female astronaut into space, Sally Ride, on June 18, 1983, and by then another Soviet woman, Svetlana Savitskaya, had flown the year earlier. In the 50 years since Valentina Tereshkova lifted off, 56 more women have flown in space (out of 534 people in total), including NASA astronaut Karen Nyberg and China's Wang Yaping, who are both currently in orbit. 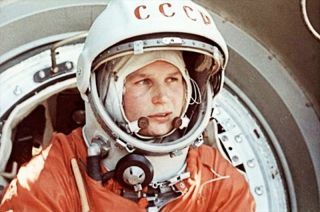 When Tereshkova reported to the launch pad on June 16, 1963, she was suited in a female version of the spacesuit previously donned by Yuri Gagarin, the world's first human in space, and the Vostok cosmonauts who followed him. Designated the SK-2, the suit was tailored for a woman, with a tapered shoulder, wider hip and narrower opening for the neck. The exterior of the bright orange spacesuit was devoid of any markings. There were no patches or name tags. The only identifier was printed across the front on her helmet, the Cyrillic letters "CCCP" (USSR). "Sewn onto the left breast of a blue thermal outfit, was a large dark-blue flight patch specially prepared by a couple of women in the Zvezda spacesuit research bureau," co-authors Colin Burgess and Francis French described in their 2007 book, "Into That Silent Sea: Trailblazers of the Space Era" (University of Nebraska Press). "It depicted a small snow white dove clutching an olive branch, flying against a backdrop of golden sunrays." "Beneath the dove, the initials CCCP had been strikingly embroidered in red cotton," the authors concluded. Tereshkova later described the mission patch as showing a seagull, in reference her flight's call sign. "I am Seagull" ("Ya Chayka") she reported from on board Vostok 6. Valentina Tereshkova's Vostok 6 mission patch, as seen still sewn to the thermal garment that she wore in space in 1963. See collectSPACE.com for the full patch and additional photos. Only a few of the patches were made before Tereshkova's flight. In addition to the one sewn to her flown suit, two others decorated training and backup thermal garments. For decades, the only way to see the patch was to seek out those historic flight suits. The actual thermal suit that Tereshkova wore in space is today displayed by Zvezda, the company responsible for its production, at its museum outside of Moscow. The backup suit is also held there, but in storage. The outfit that Tereshkova wore to train for her flight is today displayed at the Zhukovsky Air and Space Museum in Moscow. It was photos of those suits that originally inspired Dutch artist Luc van den Abeelen to launch an effort to produce a replica of the patch. "The production of a replica has been a wish of mine since I first saw photos of the patch more than a decade ago," van den Abeelen told collectSPACE in an interview by e-mail. "Close-up photos, the exact shape of the patch and measurements were unknown at the time though, so it was impossible to execute." Video still showing Valentina Tereshkova donning her spacesuit. Her mission patch can be seen sewn on her inner thermal suit. As the 50th anniversary of the Vostok 6 flight approached, van den Abeelen sought out better photos of the original patches. He also turned to SpacePatches.nl, a foundation based in the Netherlands, to obtain the needed permission and measurements of the flight patches from Zvezda. SpacePatches.nl has collaborated in the recent years with Roscosmos, Russia's federal space agency, to assist in designing and producing embroidered patches for Soyuz spacecraft crews flying to the International Space Station (ISS). Van den Abeelen has also helped design ISS crew patches, including the emblems for the 2003 Soyuz TMA-3 mission and the insignia for the station's 31st expedition crew in 2012. Working together, van den Abeelen and SpacePatches.nl have now produced replicas of Tereshkova's flight patch, both in full size and half size. "Because of the large size of the original, we decided to also produce a half-size souvenir version," wrote van den Abeelen, adding that he expects the smaller patch to be more popular among collectors. It is surprising, van den Abeelen said, that it has taken 50 years for a replica to be made. "Why a replica was not made sooner is a mystery to me," he shared. "Over the past few years, Russian companies have started to produce space patches commercially in small quantities, but Tereshkova's has never turned up." "Also, still today the first ever patch designed for a crewed space mission is not widely known." Click through to collectSPACE.com to see the first replicas of cosmonaut Valentina Tereshkkova's Vostok 6 mission patch.